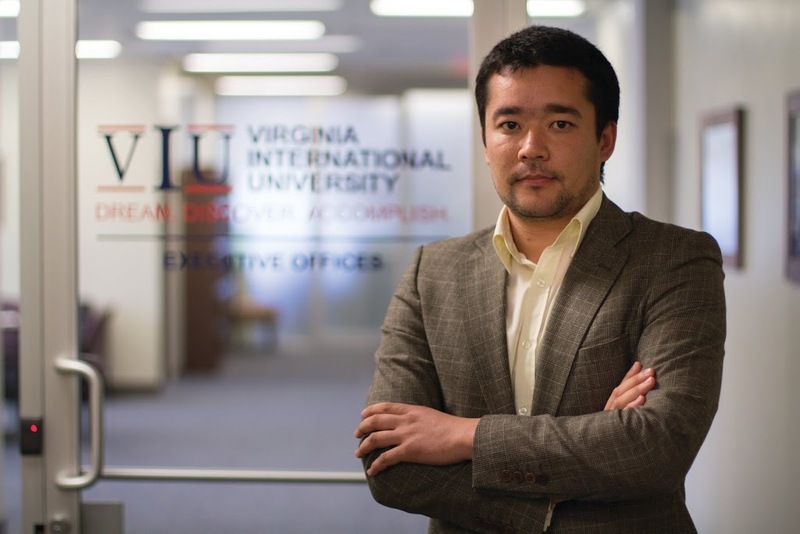 Pictured: Abror Nazirov on-campus at Virginia International University. Abror Nazirov is an Uzbekistan native working on his Master’s Degree in TESOL at VIU. Not only does he study on a day-to-day basis, but Mr. Nazirov is a young entrepreneur who founded and remotely runs his own language school in his home country. Abror challenged the status quo by seizing an opportunity to advance academically and gain experience in the United States, which will benefit his company and his country in the long term. University Magazine: Could you tell us about your company in Uzbekistan? 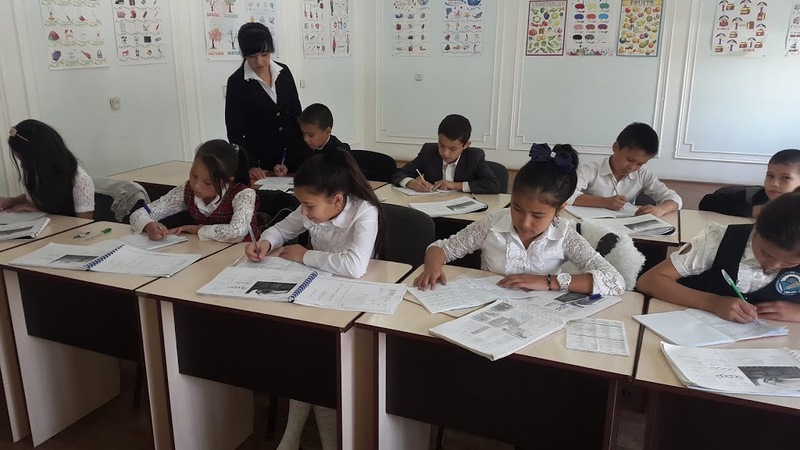 Abror Nazirov: Back in Uzbekistan, I have a private company called “Bilim Ziyo” that offers English language courses to school children and college students. Our classes are designed for beginners and advanced level students. When I first started my business in 2010, there were only 20 students and one teacher (me). Now, our center has more than 500 students and 10 English-proficient teachers. UM: Why did you choose the field of education? Abror: After I graduated from high school, I began working as a volunteer for the American International Research and Exchange Board in their Internet Access and Training Program. Six months in, I started working as a trainer, teaching internet users how to work on the World Wide Web. I was only 19 years old at that time, and that job was my first step into the education profession. UM: What inspired you to open the English school? Was it easy to start your small business in Uzbekistan? Abror: The idea for opening and running a business has been there since high school, and my dreams came true after I graduated with my Bachelor’s degree in English Language and Literature. Nowadays, Uzbekistan supports small business companies and gives many opportunities to small business owners. To get a license in the education sphere, however, I had to face many struggles because the government pays attention to the quality of the education. If you pass all the requirements, the government will support your business and your ideas. UM: Small business owners around the world find it difficult to spare time for academic advancement. Was it difficult for you to find time to study abroad? Abror: In January 2015, I received an F-1 visa to study in the United States of America. Although I had a visa to come to the US, I did not arrive until August 2015, the reason being for my business. In the beginning, I found it difficult to leave my business and study at VIU, but later on, I made up my mind to try my luck at obtaining a master’s degree. While it took me a long time to make a decision, I do not regret it now. Upon coming here, I have created opportunities for myself and my business, both from an academic and personal perspective. I would say that as a businessman, it is very hard to leave the business that you are running because you must think about the risks you will face leaving it alone. Sometimes, however, it is necessary to take risks for the sake of your company. As wise people say, “There is nothing impossible to those who try,” so I believe that everybody needs to try his or her luck. People should improve themselves by creating change in their life. One of the advantages in owning my business is that I’ve been able to hire good teachers for my team. These people can take care of things while I am away. I am really proud that all the people who are working for my company are experienced and qualified teachers. UM: Why did you choose VIU over other universities? Abror: I heard about VIU from my childhood friend who is studying for his MBA in Global Logistics at VIU. I chose VIU because it offered the program I was looking for with an affordable tuition fee. I conducted research about British programs like CELTA and DELTA, but these programs are very short and expensive. I also liked the location in the state of Virginia and convenience to the capital of the United States. It’s great that VIU is internationally recognized, because I have met students from all over the world with different cultures and traditions. It’s a big life experience for me. UM: Have you noticed any differences between education systems in the US and Uzbekistan? Abror: There are huge differences between the educational system in Uzbekistan and the US education system. As an example, students in Uzbek universities have to take compulsory subjects, although they are not related to the field the student has chosen. In the United States, students choose the classes they need, the classes related to their field of study. In my opinion, these elective classes are more effective than compulsory classes. The American education system is also computerize, which enables students to study online via the Moodle system. UM: Do you believe that you will be able to make a different in the world following your graduation from the TESOL program? Abror: Yes. I especially love working with children, I love teaching them. Even before starting my MA in TESOL, I had already made some changes in my education center. For example, I made changes our teaching methods by using e-books, online classes, etc. and that made a difference. Students studying at Bilim Ziyo in Uzbekistan. Obtaining an American degree will help because it is recognized all over the world and welcomed in Europe, Asia, and other continents. It will give me a great opportunity to travel and work in different countries like China, Singapore, Thailand, Saudi Arabia, etc. UM: VIU also started as a small school in 1998. Does that motivate you to grow your own school? Abror: In my country, especially in my city, a private education is not supported by our government. VIU gave me the motivation to build my business in the education sphere. Though I have been studying at VIU for a short period of time, I have learned a lot and gained experience. Moreover, my parents have always supported my motivation and vision. UM: What are your plans after graduation? Abror: After graduating with my MA in the TESOL program, I would like to do my Optional Practical Training and teach international students in the United States or any other country. I am also looking forward to offer training courses for school teachers with the new methods of teaching English that I have learned. UM: What is your message for entrepreneurs and students in Uzbekistan? Abror: Everyone has a chance to study, whether it’s in Uzbekistan or in the US. My advice would be to try and reach your goals, never give up, and do your best to achieve your dreams. For students seeking an affordable and quality education, I would highly recommend studying at VIU. Not only because of these reasons, but because of the location and the friendly people that live in Fairfax County.